English is not the primary home language for almost 10 percent of kindergarten through twelfth grade (k-12 ) public school students. The US Department of Education, as reported by the National Academies calculates that English Language Learners “are the fastest growing educational subgroup in the nation.” (page 7). According to the Migration Policy Institute, “many school districts are struggling to develop the capacity to meet the needs of these nearly 5 million children from immigrant and refugee backgrounds.“ (para 1, lines 1-2). This struggle extends beyond the classroom to the nuts and bolts of school operations: finance and funding. A sure way for capacity building within any organization is through added resources such as: manpower, training, facilities and equipment. How are capacity-building initiatives financed? With Title III public grant funding (both local and federal). According to EdSource, Title III funding for states amount to $737.4 million annually. Even though this may seem like a monumental sum, just 11 percent of all education funding “originates at the federal level.”(para 3, line #1). Millard concurs. In completing a study for the Education Commission of the States, she writes “ 46 states allocate additional [emphasis added] state funding dedicated to supporting ELLs [English Language Learners].” (para 2, line #3). There are a host of methods by which states use to close the gap between the needs of the migrant population and available resources. One such method, is to reduce or cut non-federally mandated programs like sports and Advanced Placement classes (see Migration Policy Institute, page 2, para 3). Other methods may involve the misrepresentation of data submitted to the federal government as a grant application for funding. Fraudulent actions are the over-reporting of migrant students, the over-estimation of migrant students needing English language services, and the vague interpretation of the services provided. Compounding these practices and confounding accurate program evaluations and audits, the federal government allows states to select between two options for counting migrant students. And, localities, counties, districts and cities can also select their own method, independent of their state. The laissez-faire attitude and relaxed nature by which federal and state funds are distributed makes the system vulnerable to exploitation. As mentioned throughout in my book (pages 36, 47, 49, etc) and this blog states can find creative ways in which to report the data, mis-report, and manipulate the data to claim government funds. Faulty data reported to the federal government for grant funding purposes is not new. In 2005, The Government Accountability Office (GAO) comprehensively reviewed migrant data and discovered considerable variability in state estimates. See National Research Council reference in Resources Section. As a baseline, the GAO utilized the U.S. Census Bureau’s American Community Survey (ACS). In summary, it was concluded based upon a dataset from 12 states “the differences in methodology yielded very different LEP [limited English proficient] estimates, which could result in very different fund allocations to the states [emphasis added]. The review showed that ACS estimates were higher than counts based on state data in six cases and lower in six cases; the differences were sometimes quite striking. For example, based on data for the 2004-2005 school year, the ACS estimate of LEP students in California was almost 50 percent lower than the state’s estimate, and the ACS estimate for New York was almost 40 percent higher than the state’s estimate.” (page 13, para 5, lines #1-3). Which brings me to my next point prior to closure. Which states are more at risk for ELL program fraud? The Migration Policy Institute estimates two-thirds of ELL students live in California, Florida, Illinois, New York, and Texas. States with significant growth (more than 100% in an approximate 15 year period) are Arkansas, Kentucky, North Carolina, South Carolina, and Tennessee. It’s interesting too that many of these very same states have adopted Sanctuary City policies. 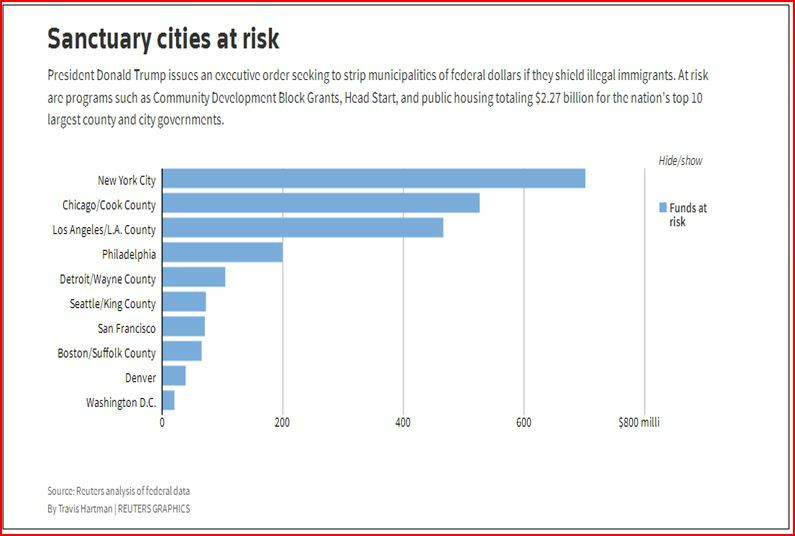 For instance, “Reuters analyzed federal grant records to tally the estimated federal funding at risk among the 10 largest cities which totaled an estimated $2.27 billion.” (para 1, line #1). Carroll, Respaut, and Sullivan elaborate further. They write, “among the funds at risk are $460 million that the federal government gave out to fund Head Start pre-school programs in the 10 largest ‘sanctuary cities’ in the most recent fiscal year, the analysis found.”(para 12). So with the political posturing on both sides, one wonders if the likes of the Mayor of Chicago and others really care about quality of life, equality and opportunity for advancement of all youth (including migrants) residing in their cities. Or if it is only about the money. But, then again, I’ll leave that fight for another day. National Research Council. 2011. “Allocating Federal Funds for State Programs for English Language Learners.“ Washington, DC: The National Academies Press. doi: 10.17226/13090. Millard, “State Funding Mechanisms for English Language Learners,” Paper 11694. Education Commission of the States. Denver, CO. January 2015.